Ban-yan Day on board the Magnificent; or, Pease Porridge hot from the Coppers!, John Nixon, 1789, British Museum. 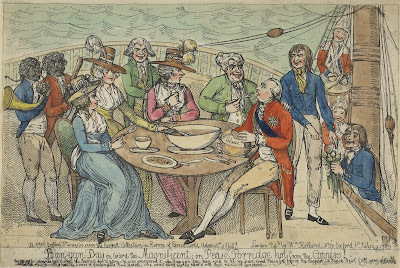 Here King George III is depicted dining on the 74 gun Magnificent. Built in 1767, the Magnificent served the Royal Navy well through the American Revolutionary War and into the Napoleonic wars, before striking an uncharted reef and sinking in a mere hour and half off the coast of Brest in 1804. Miraculously, the entire crew survived. John Nixon illustrates a scene of His Majesty and a small retinue on the Quarterdeck of the Magnificent on Banyan Day. One day a week the meals aboard Royal Navy vessels were without meat. King George inquires after what the seamen eat, and then asks for Pease Porridge. Accompanied by a full punch bowl and cheese, the small gathering are treated to music and the smiling faces of common tars as they dine. Two common sailors stand to the side, watching the meal of their sovereign. Standing tall, one sailor wears his loose hair at shoulder length, and a yellow neckcloth. His double breasted blue jacket ends at the waist, with cuffs closed with cloth covered buttons. Close fitting white trousers end above the ankle, showing his pointed toe shoes, rectangular white metal buckles, and white stockings. His mate has a remarkably long queue bound tight, and tied with a bow. He has also buttoned shut his mariner's cuffs, but appears to be wearing a single breasted jacket with flap waist pockets and white metal buttons. 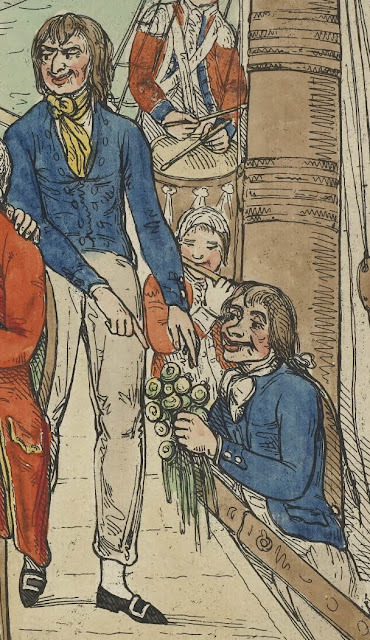 His neckcloth is white, as are his trousers or petticoat trousers/slops.